May 16, 2019 fundraiser at Tap & Burger Sloan's Lake! Join us for our end of school year fundraiser with our friends at Tap & Burger Sloan’s Lake! All donations will be 100% matched! Additional info coming soon! 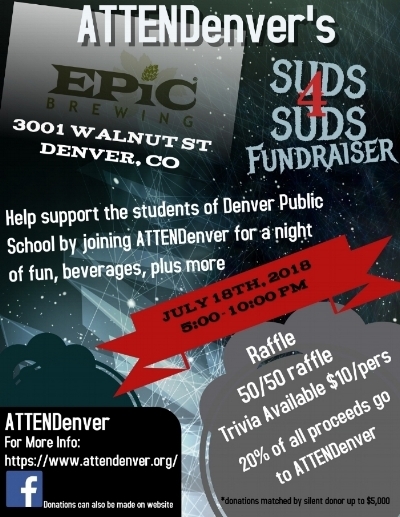 July 18, 2018 Fundraiser at Epic Brewing! Join us for our first fundraiser of 2018 on July 18th with our friends at Epic Brewing! ATTENDenver's inaugural fundraiser will be on December 14, 2017 at Blackbird Public House from 6pm - 10pm. For more information and to RSVP, please visit our Eventbrite registration page!